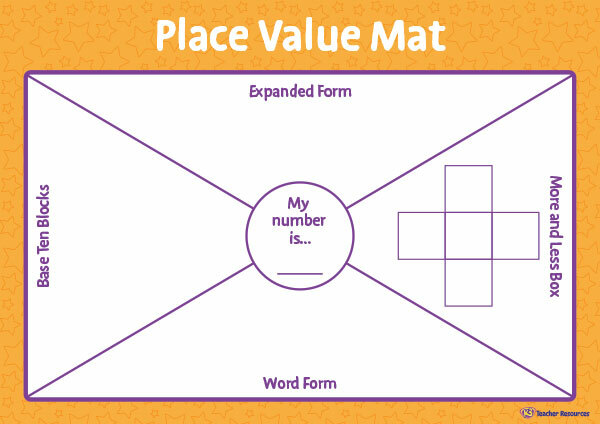 A place value mat to use as a warm-up activity to help students explore the place value of different numbers. Ideal to use when exploring place value in the classroom. Children use the mat to record a given number in expanded form, word form, with base ten blocks and using a more and less box. Print and laminate a class set that can be used over and over. Provide the children with a number of the day. Children use a removable marker to record the place value of their number. What comes next? – Repeat the activity with different numbers. Use the mats as a quick daily warm-up activity.